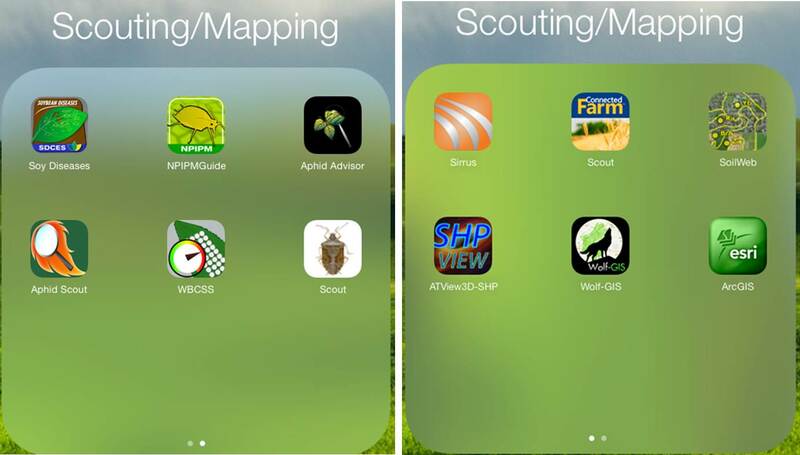 For 2017 InfoAG I was challenged to review the available mobile scouting apps. 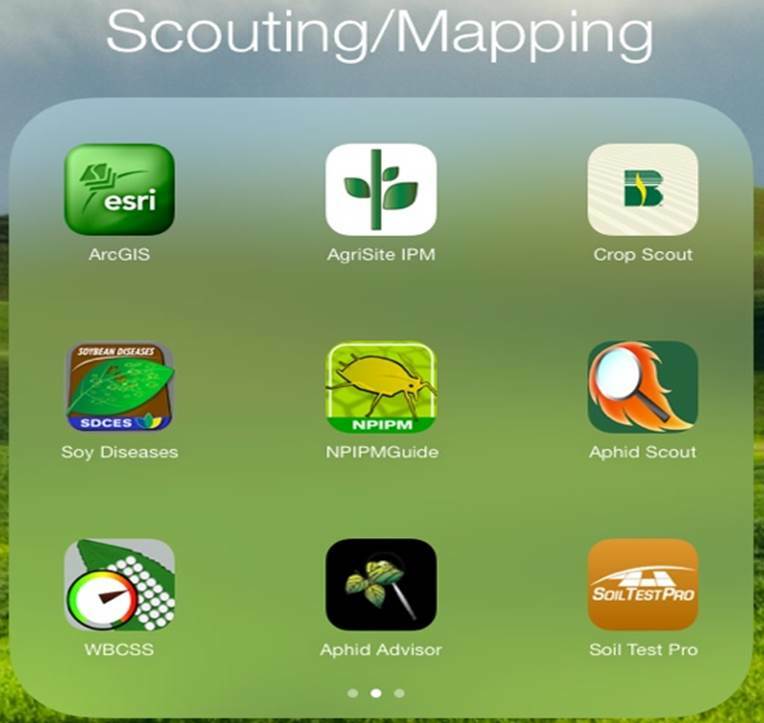 While I have been reviewing ag apps since the summer of 2013 https://osunpk.com/2013/07/30/agriculture-app-for-the-ipad-and-iphone/ , I had yet try to tackle a group as complex as scouting apps.My first challenge was to locate all relevant apps. 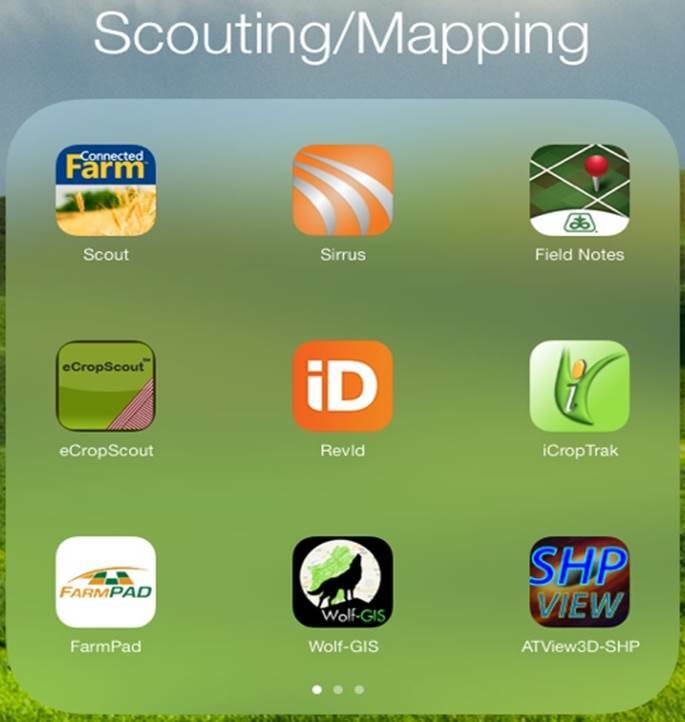 My search began using social media and the search terms Crop Scouting, Field Scouting, Ag Scouting, and Farm Scouting for both iPhone and iPad apps. After a week-long hunt I had found around 30 apps, although I am sure I missed a few. As most of these app require payment, I assumed most would have a 30 day free-trial period. So towards the end of June, about a week out from the meetings, I started trying to gain access. As I did this I kept records in an excel file on how the process was going. I found that with nine apps I had immediate access via the app, for seven apps I was able to request a demonstration, and for another six I used the contact us option and requested a demo via that method. By Friday, July 21st, I had access to 17, my presentation was on Wednesday the 26th. I should note that a few more demos were provided after the presentation, but are not included in this review. List of all apps downloaded for the review. After I gained access I went into iTunes and Google play to determine where they could be found. Mobile devices applications are available for. During the signup and trial phase most apps offered/suggested/preferred that I went through training for supervised demonstration of their applications. I chose to pass on the training. The first reason was simply due to time constraints, as my presentation data was approaching rapidly by this point. More importantly, I wanted this review to be useful to the people I know that are interested in these apps, and I also know that many of these people are just the type to try something without instructions, you know who you are! So my observations are based entirely on how well I was able to intuitively use the applications. There is no question if I had gone through the training I would have picked up on several items I likely missed. Also it should be noted many of the demo versions I had access to had limited functions. Evaluation of the apps took place in the field, office, and home. Near the end of the project I spent many hours reviewing notes and going back and forth between the mobile and web based versions. Home work space. Laptop for web applications, iPad mini for app review, iPhone and notebook for in-field notes. 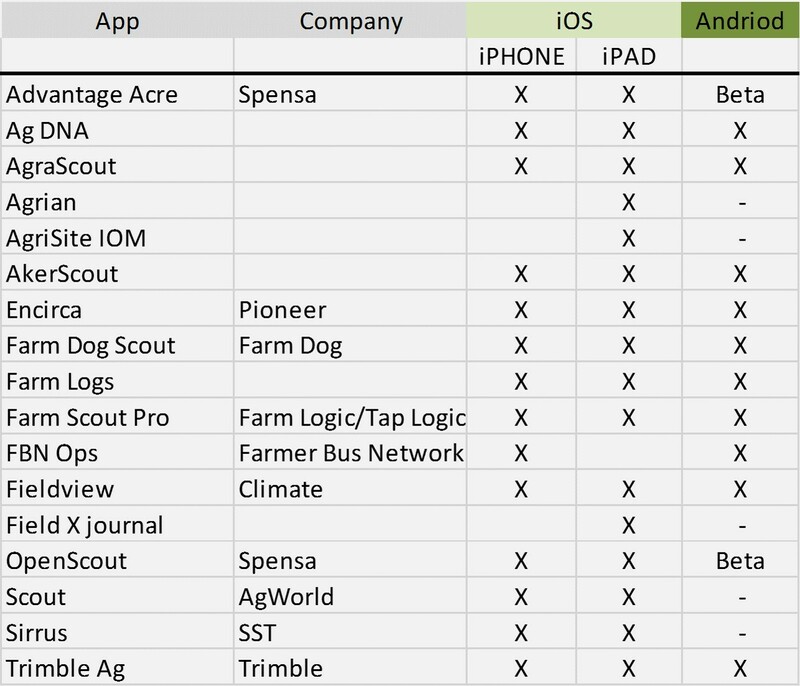 As I was working through each of the apps, I tried to put myself in the shoes of a private crop scout, much like many of my friends are. This is an important point to consider because as I dug deeper into the applications I came to realize that many of these apps were developed with larger consulting firms in mind. The next table has some important ramifications depending upon the user. Almost every application had a downloadable software or web-based form utilized for operation management. Some of the apps that fell into the category of “Needed to Perform” are the apps which a field boundary or scouting trip could not be initiated from the mobile device. It is those applications that needed a manager to set fields and/or assign task which I deemed where meant for larger consulting groups, as this strategy would not be efficient for a one or two person operation. These applications did have some impressive functions allowing managers to follow scouts progress and direct operations near real time. 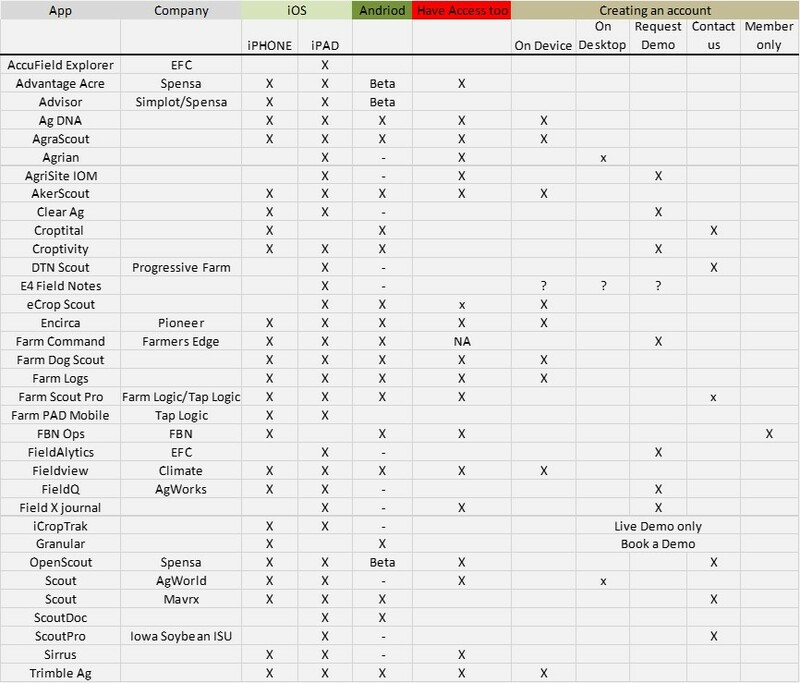 If a web or desktop based program was needed to direct actions I categorized the application as best fit for larger consulting groups. One of the first tasks I wanted to review was the creation of field boundaries. From the view point of a private consultant, I put an emphasis on those apps which could draw field boundaries from the mobile device. The use of CLUs (common land units) was an interesting way to load boundaries, more on that in a bit. Most applications that utilized CLUs did so in the desktop program, however several apps also had the option within the mobile device. A few of the desktop apps also allowed the import of shape files to set field boundaries, it was the only option in Field X. 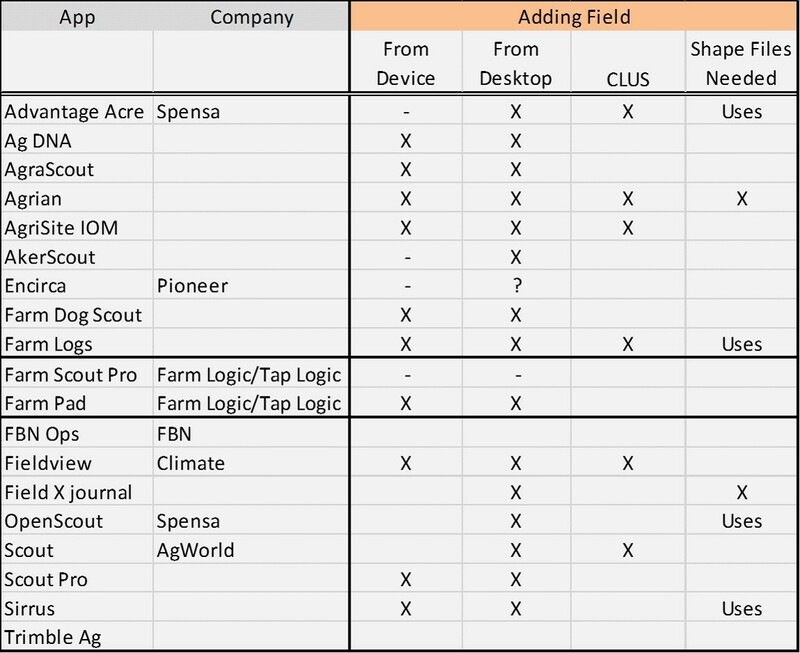 This table shows which mobile applications can apply field boundaries from the device, which applications utilize CLUs (common land units) and shape files. Drawing field boundaries was the one area that some apps really separated themselves in terms of functionality. For me, the mobile device field boundary winner was the AgDNA app. Their use of the cross-hair with pin drop at the top of the screen increased the accuracy of the pin set. Often, when dropping pins or moving the pins in other apps, the placement would be off due to poor finger to eye coordination. Sirrus and Agrian tied for 2nd, and both provided a zoom option for the pin after placement. AgriSiteIPM provided a nice function where the application dropped an additional pin between any two that I placed. I found this to help speed up the task and allowed me to make some refinements a bit quicker. All other applications were equal. AgDNA field boundary draw tool. Sirrus Field boundary draw tool. Agrian Field boundary draw tool. AgriSiteIPM Field boundary draw tool. Now back to the CLU conversation. With CLUs the application draws the boundaries for you. I must say that, when it works properly, it is a very nice function. Below are two examples of fields I used CLUs to define field boundaries. Field boundary building utilizing common land units (CLUs). Often this was a very nice feature. However CLUs did not consistently identify the proper fields. 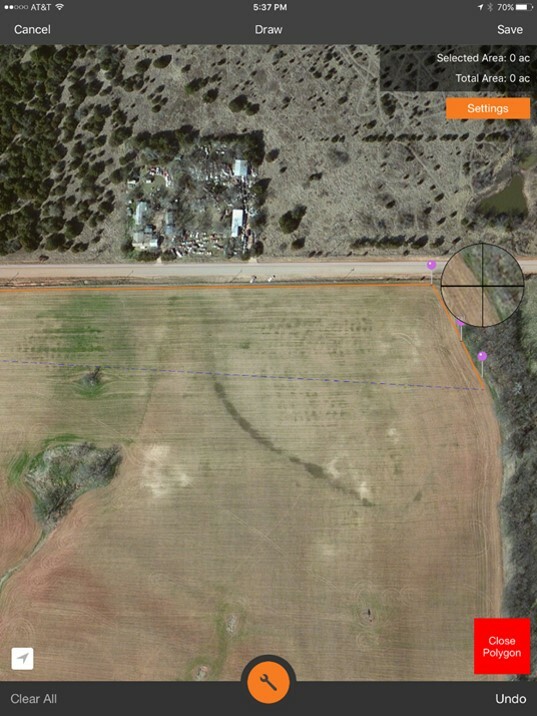 In the examples below, the L field on the right is actually two separate fields with a dirt road between them, the example on the right only identified the grass waterway and left the field unselected. The saving grace is that all of the apps with CLU option also had the draw option, so if the CLU did not work I could just draw it in manually. So in the long run, no harm no foul. Field boundary building utilizing common land units (CLUs). Just as often this feature did not work for the fields I wanted. The next task I evaluated was entering crop/field information, such as crop type, variety/hybrid, planting date, fertilizer, and pesticide applications. My preference was that this task could be accomplished from the mobile device. As it turned out many of the applications which would function better for a larger organization did not allow for this information to be entered via the mobile device. 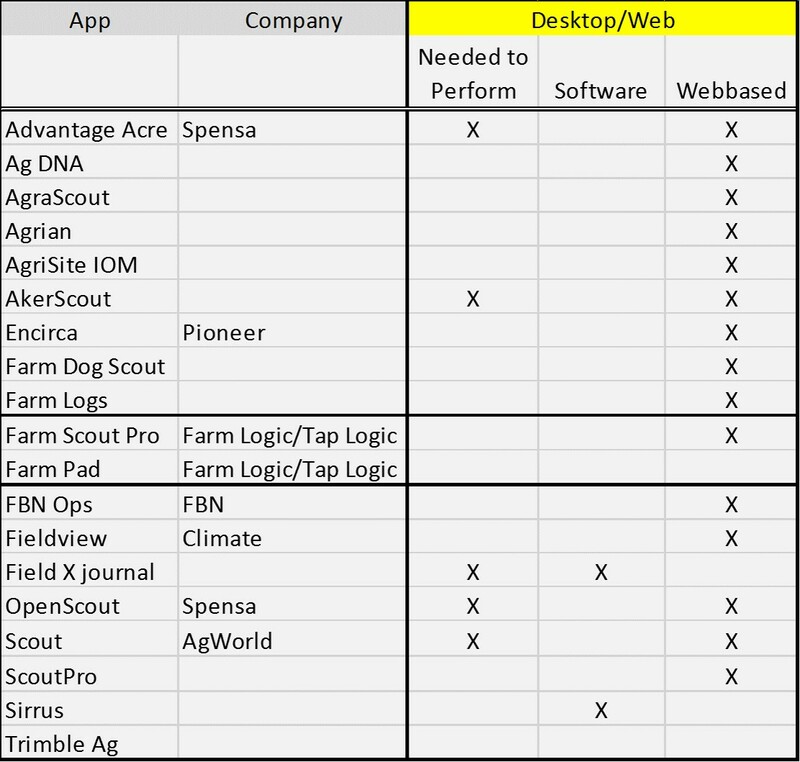 Also, as a soil scientist, I was bummed by the lack of apps with the ability to bring in SURGO data, and even more let down that the majority of the desktop versions did not utilize this data layer. 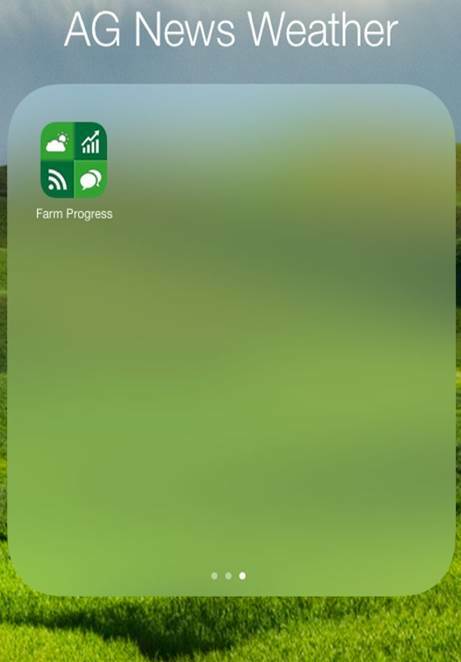 So, with that being said, a big props to FarmLogs for being the only mobile app with the capability of downloading SURGO data layers. 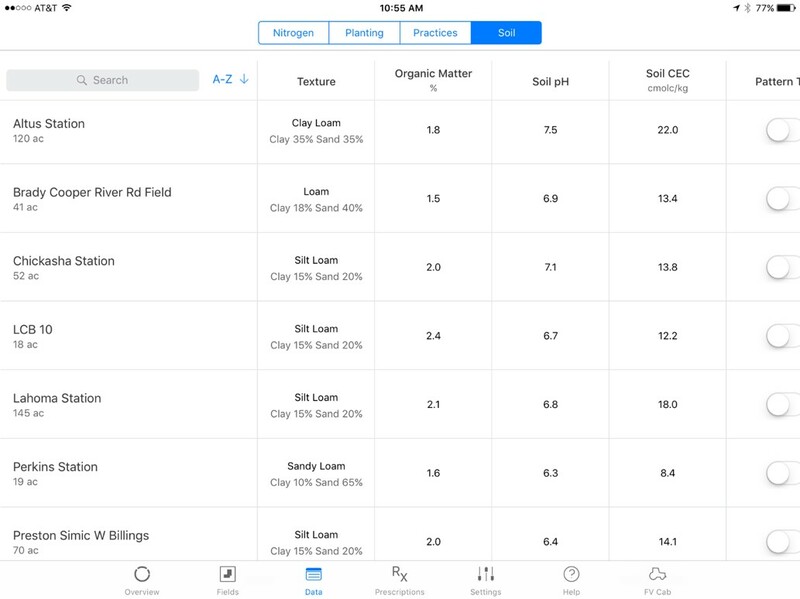 Climate had an interesting “soils” portion of the app, where it provided a table listing predominate soil texture, percent organic matter, soil pH and CEC. A note on the Climate soils data, while the soil texture, OM, and CEC are not far off the average, I felt that the pH was off by a bit. This is not unexpected however as, of all the reported variables, pH is the most impacted by human activities. 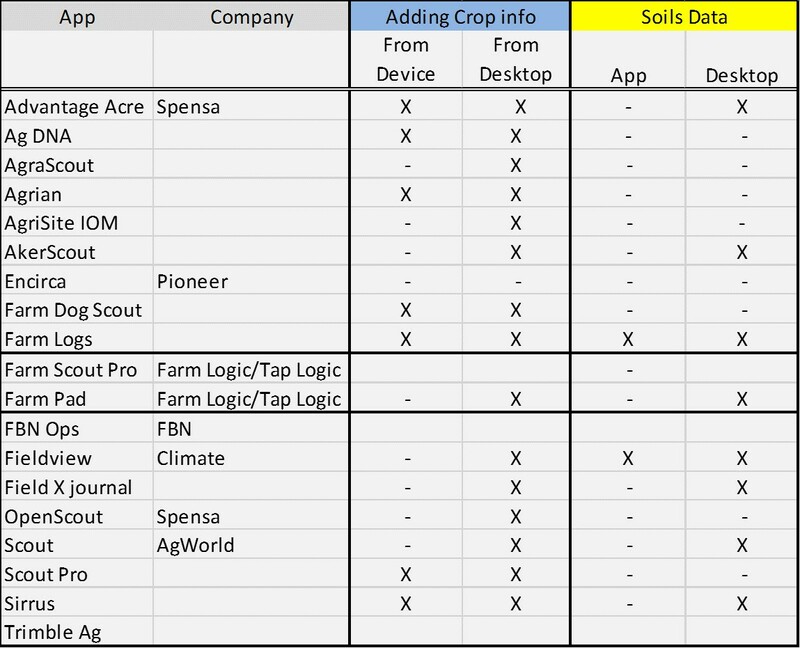 This table list the applications which the crop information (crop type, variety/hybrid, population and planting date. The table also list the applications which had access to SURGO soil type data. 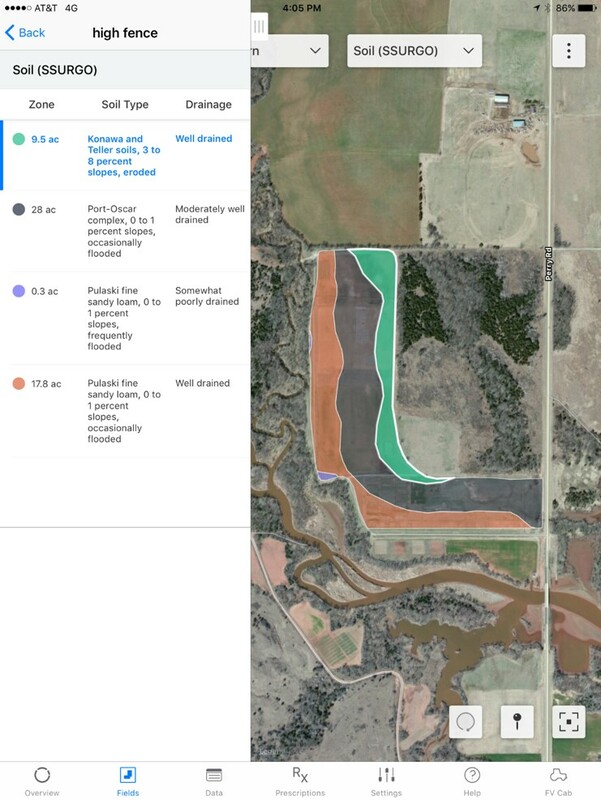 FarmLogs brought SURGO data directly into the application. Climate provided fields dominate soil texture, estimated OM%, pH and EC. Below is a summation of the weather functions of mobile and desktop applications. I categorized the data as Historical (multi-year average), Past (either calendar or growing period weather), Current (today’s temp and wind), and Forecast (3-10 day forecast on either a daily or hourly basis). From the consultants viewpoint if I am out in a field trying to determine if I should recommend a nutrient or pesticide application weather is a BIG part of that decision process. So having the current weather and forecast in hand when I have to make that call is a great tool. The past/historical data is something I really enjoyed looking at, and could spend hours doing, its impact on management decision is not as critical as forecast, but is still a tool I appreciated. 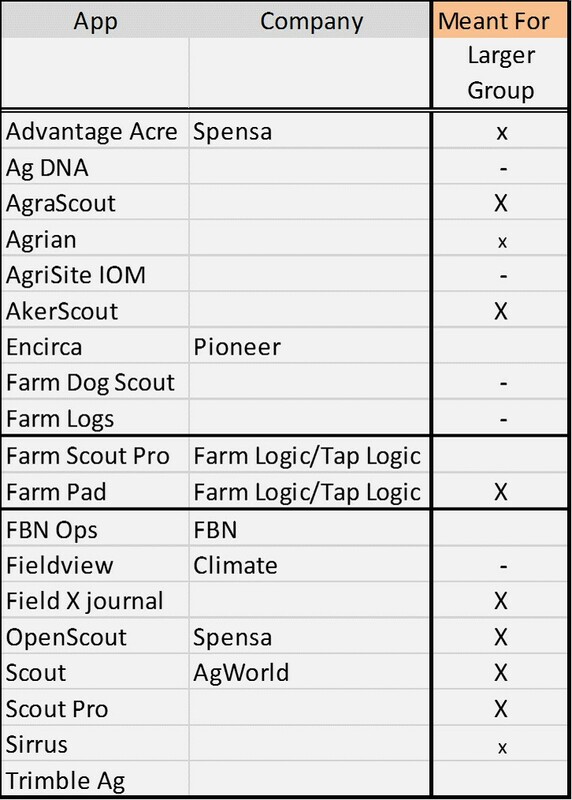 With that, Climate and Sirrus were the only mobile apps with a forecast function while Farm Logs had nice past data functionality. This table shows the weather and forecast features on the mobile and desktop applications. Sirrus shows current weather on the fields home screen with the option to look at hourly and 10 day forecast along with historical precip data. Climate provides current weather, hourly and 6 day forecast along with seasonal weather data based upon field planting date. Within the Scouting Section I was looking for in field functionality of collecting information and sharing. As expected, all apps provided the ability to drop pins via GPS and add notes and images. Some apps also allowed the user to select the location to drop pins. I liked the ability to add stand counts and a few applications actually allowed the users to collect multiple sampling points and provide an average. This is a nice function that promotes proper sampling techniques. Both Agrian and Sirrus provide directed sampling functions, I specifically liked being able to set up a grid on site and sample immediately. From the aspect of a private consultant, I felt it would be extremely important to be able to share scouting reports and recommendations from the application in-field. Some of these were very simplistic emails others send PDFs. This list shows the scouting functions of the applications reviewed. As far as just “cleanness” and functionality of scouting goes, I personally really liked the scouting layout provided by OpenScout. I also gave good marks to AgraScout and Agrian for their user friendly interfaces. The Open Scout layout during scouting was quite clean. Personally I am a big fan of having pictures of the pest. Aker Scouts function of having images with their pick list was nice and I could see it really coming in handy. Better yet, when the pest was selected a detailed description was presented. 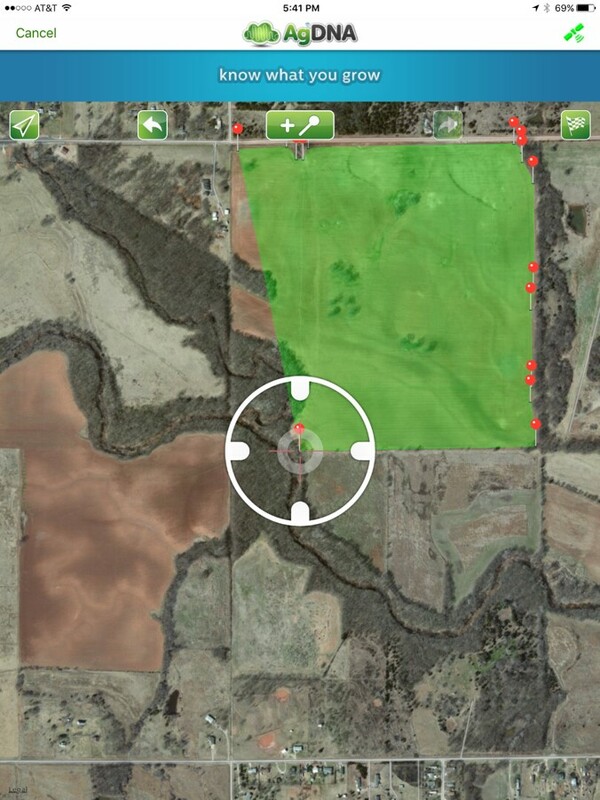 AgraScout also had a nice function that when a pest was selected from the picklist an image of the pest would pop up. Unfortunately, at the time of testing this app had a bug and in the insect picklist the wrong insect often came up. Aker Scout had images with each of its pest options. First look at the ScoutPro I loved its function of a step wise pest selection tool to get too my problem. That said, after a few times it wore me out. I did not need this process to identify pigweed and johnsongrass, and felt it was forcing me to make more clicks than necessary. 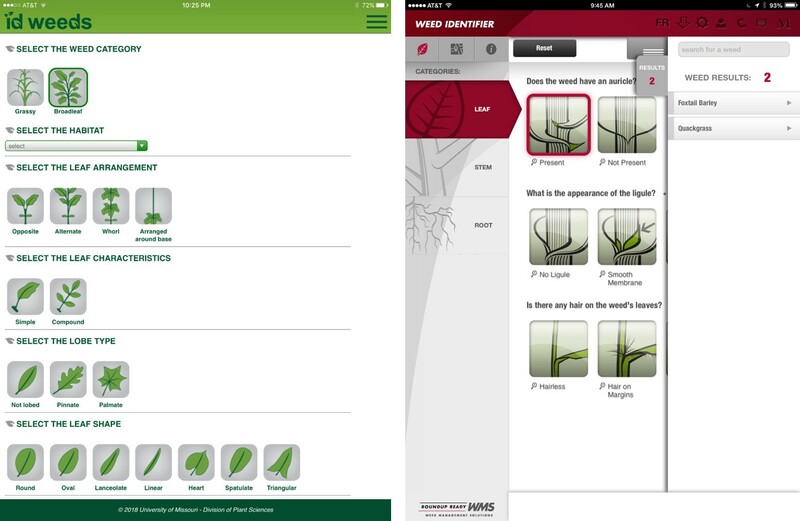 Scout Pro takes users through a ID tool to help select proper pest. The final function hearkens back to my precision ag background. Four of the applications provided the opportunity to build management zones, and from what I could determine from my versions, three of the applications could build and export shapefiles for application. With the image arms race so active right now, I also looked at which applications included satellite imagery. The five listed below are the ones that actively promote the purchase of imagery within the mobile or desktop applications. 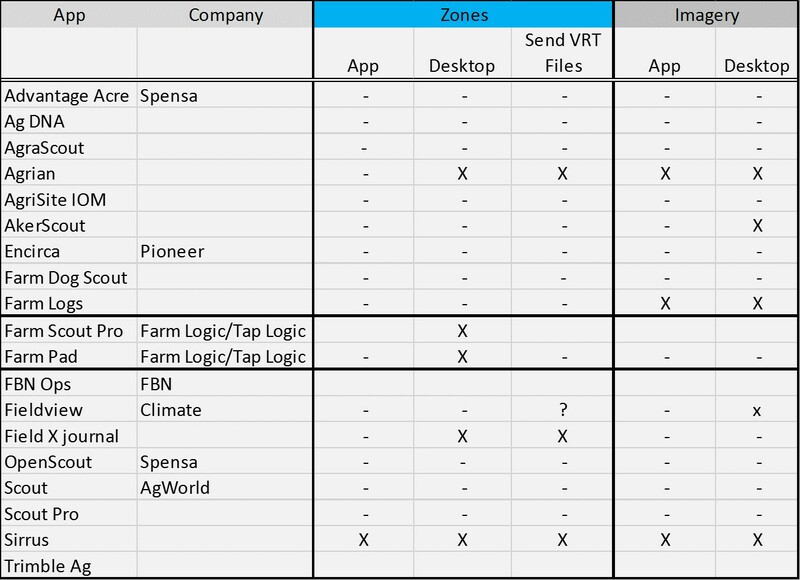 This table list the applications with can create management zones, send VRT files, and have access to satellite imagery. The following are comments taken directly from my observations. I have left all notes in this, and in some cases you can see where I could not find a function, then later made a note that it was found. Field Select, Auto via image or drop points. Took a while to set up boundaries on app, figured out later. Recording software. Does a great job of recording activities. Dropping pins not that precise. If adding in field, cannot scout immediately as it needs assignment. 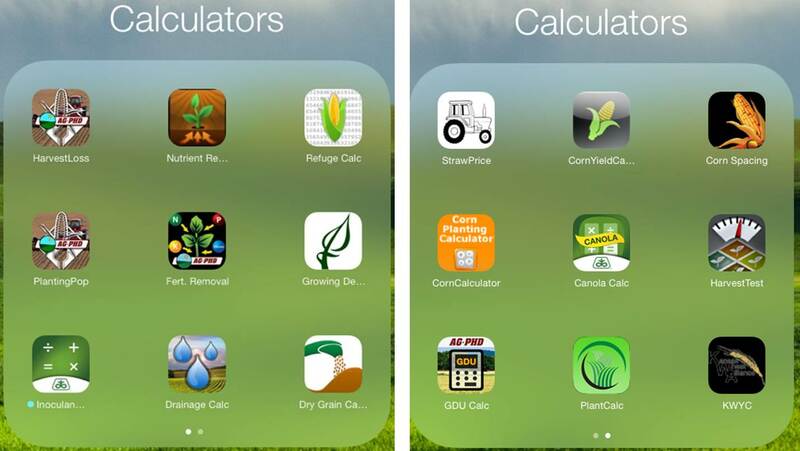 Agronomic Manager App, not one would suggest for private consultant. does not look like whole scouting trip. Trouble saving notes Growth Stage was blank, image loading errors. Option list was very short. Not a fan of the annotations noting method. 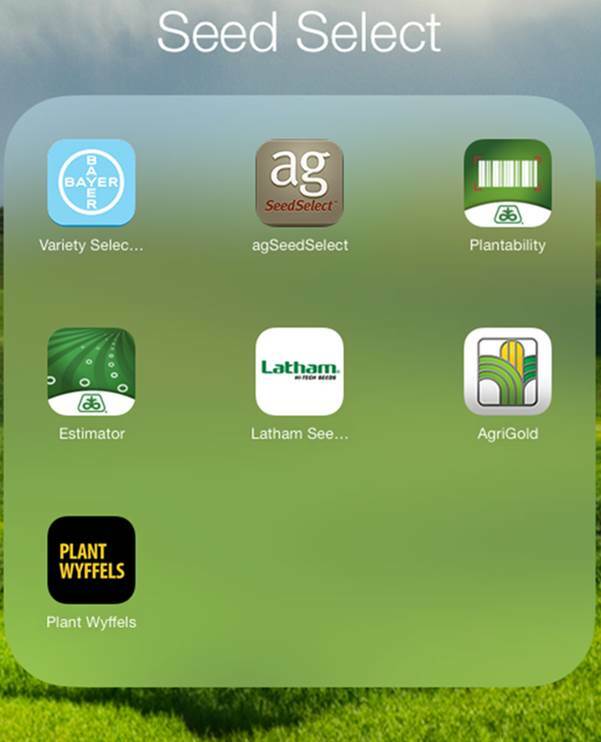 Seems like a good Manager/agronomist app. But not allow on the go field set up is a challenge. Drops pins, not sure about after fact edit. While entering field data if you hit outside of box, you lose. 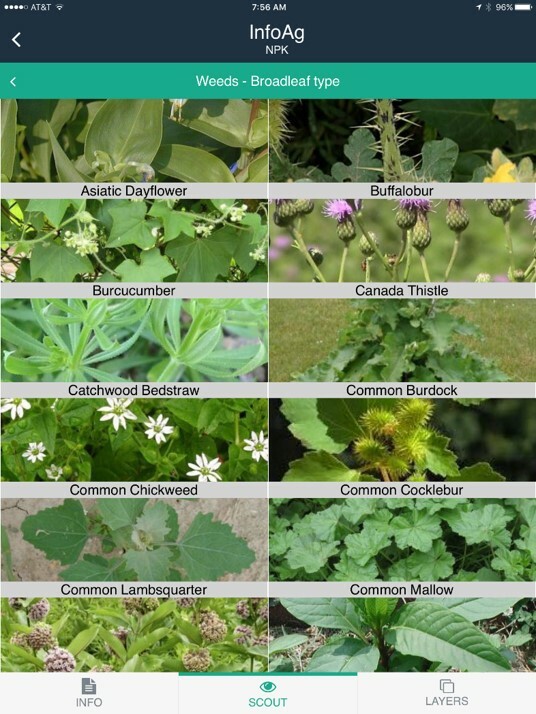 Has insect and disease list, no weeds. In App Auto field select. Can do from Ipad hooked to internet. Crazy long load time in web. Don’t typically have demos, offered 1 few week then charge card. A bit clunky in app and Desktop but good functionality. Auto Selects boundaries, can not easily edit lines. Geo Note a point reference app in beta. Manager Picklist, Extremely Extensive list. But Have to create pick list. Needs internet to add from location. Desktop drops a pin, but think it needs shapefile. Needs attributes set up by manager. Don’t like going through steps to Get to something I know. 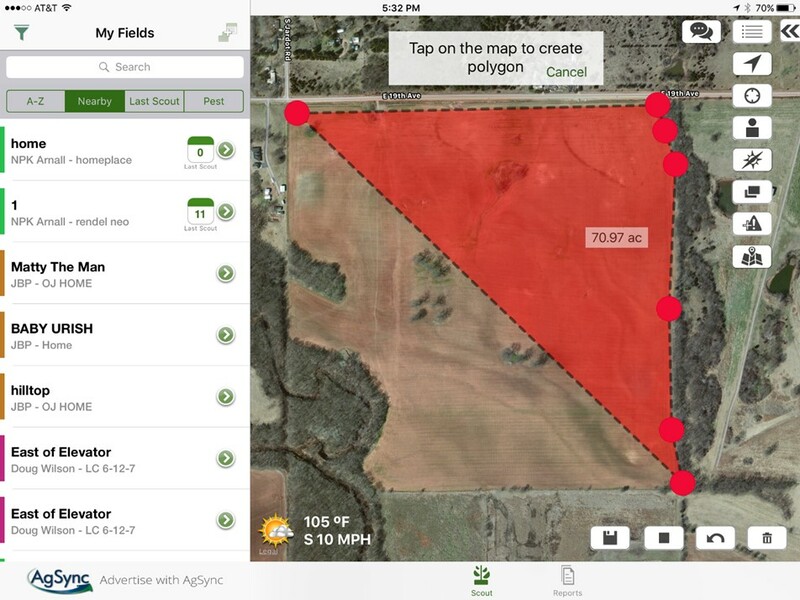 Has a buddy app, that the producer can use to see fields. would work in a larger comp also. My final take home from this task was that I don’t want to have to do this again. It was a wonderful challenge that took a lot of time and energy, and I still only looked at 50% of the available applications. My comments to those looking for an app, reach out and try as many as possible. Every app has its own fit and there is no one size fits all. If you find one or two you like TAKE THE TRAINING, I know I missed aspects of many of these applications, but I was testing the intuitive nature of the programs. My comments to application developers, don’t forget the private consultant. I really don’t feel like many of the applications I tested had the independent consultant in mind. Instead they are targeting large groups, and this is understandable from a marketing stand point. Consider adding a function that, when a scout leaves the field, a note is sent to the producer notifying them that the field has been checked. I can see this being a great value added product, allowing the producer to immediately know that their scout is taking care of them. Since my Ag App post in July I have presented on the topic an additional five times and have two more on the books for 2014. A good thing about doing talks is that you have to update the information to remain current. Which in all honesty, when it comes to technology of any kind this is quite challenging and even more so for Smart Phone Apps. In July when I first blogged on the subject I had 76 apps on my iPad. 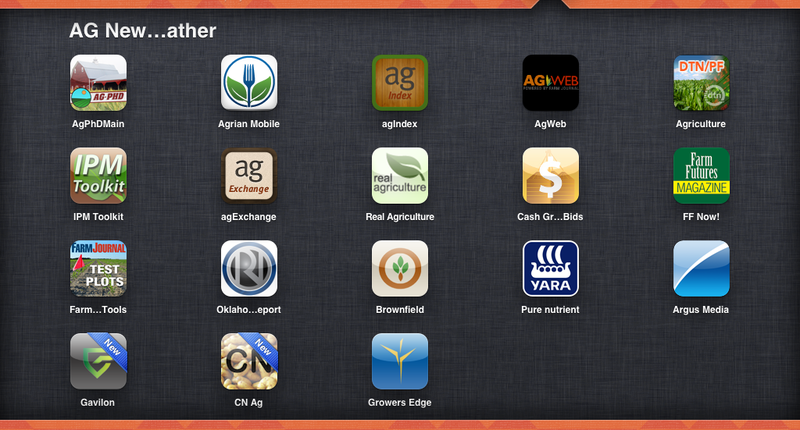 Today (1.3.14) I have 111 apps on my iPad, for both the iPhone and iPad, that I deem to be Ag related. 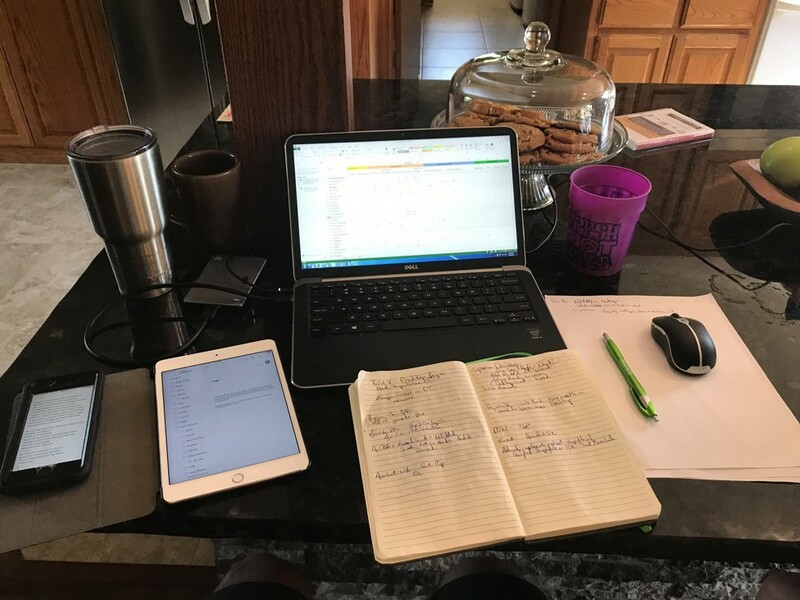 Since the summer I have found new favorites, changed some, and added categories but for the most part I still maintain my 2 minute rule stated in the first blog. I have allowed a bit more leniency in that I now say “If I cannot figure it out in 3 minutes it’s GONE. An app should be intuitive, easy to use and have a purpose. They only exception to the 3 minute rule is the Scouting and Mapping Apps. Because of their complexity I allow them 5 minutes, and then I am done. Any app with GIS in its name gets much more time” I guess I am just getting soft. Again I must make the obligatory statement; I am not a developer, designer, or expert. I am just a user who has had a chance to look at a few apps. Almost all of the apps I have are free and I am sure I have missed a few. Please share those with me. I am also not discussing Mobi’s, this is another large group of quality decision aid tools. I am also not discussing none apples apps. This is not because they are not relevant or important, it is because I do not have that technology. 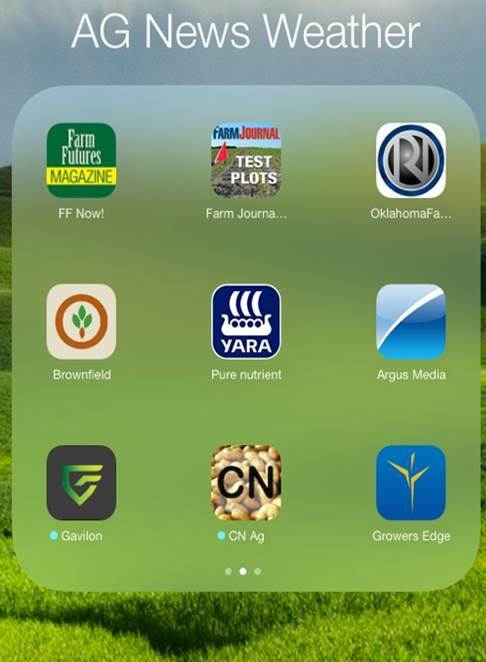 Ag News/Weather/Markets, Scouting/Mapping, Record Keeping, ID Tools, Crop Tools, Calculators, Sprayer/Chemicals, Fertilizer, Seed Select. Apps are nice because the majority are stand alone and do not need internet or cell connection. This means they can be used when you are in the middle of nowhere, which is a great deal of Oklahoma, and have no service. 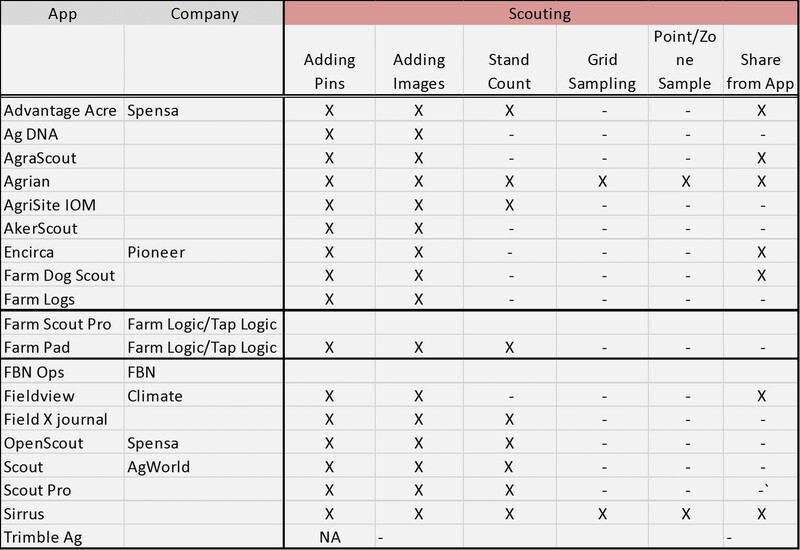 This will exclude many of the Ag News/Weather/Markets, Scouting/Mapping, and Record Keeping apps that need positioning or location information. Now let’s discuss some of the new and old apps. Not much change in this group however I have added one or two. This category has changed the most. 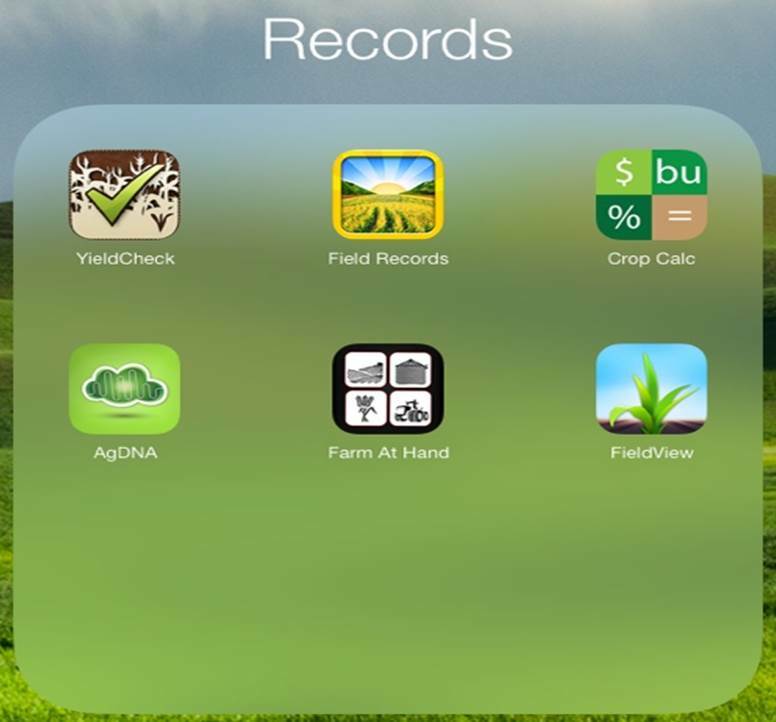 Record keeping apps have been removed and several new apps added. The only free apps which can create boundaries are still Scout and Sirrus. To date Scout remains to be my favorite app for in field scouting notes. Pictures tagged with Lat Long and a note is very useful. My knock on is app is its boundary creation. It is a challenge every time as it is hard to remember the steps and not make a mistake. That is where Sirrus comes to play, by far the best boundary creation app. 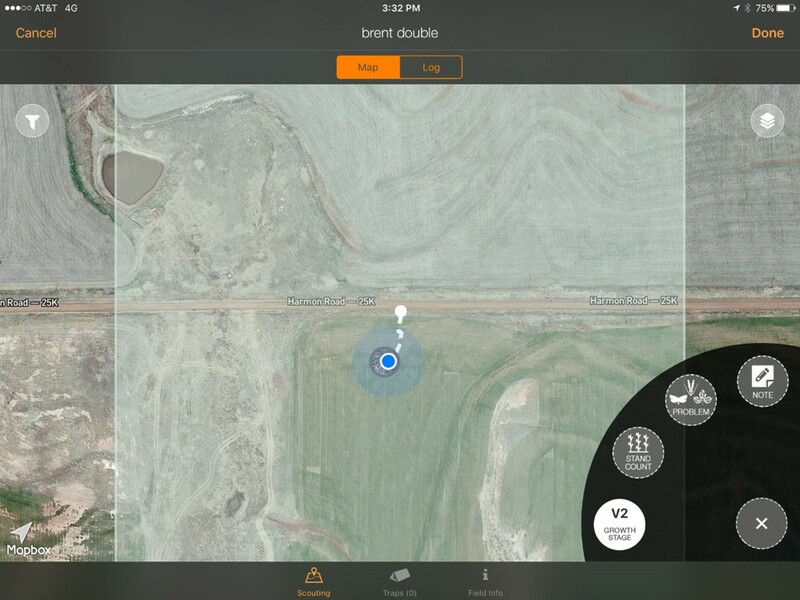 Sirrus has easy to use tools for both point and pivot boundaries. I like the edit vertex zoom in tool that resembles a rifle scope. I was able to add 12 fields in a matter of 20 minutes. Being able to create grid soil sampling scheme and record samples is also a very nice tool. My favorite part of the app, the UNDO button, and all apps should include this. The drawback to Sirrus is that it has no ability to take notes such as Scout. 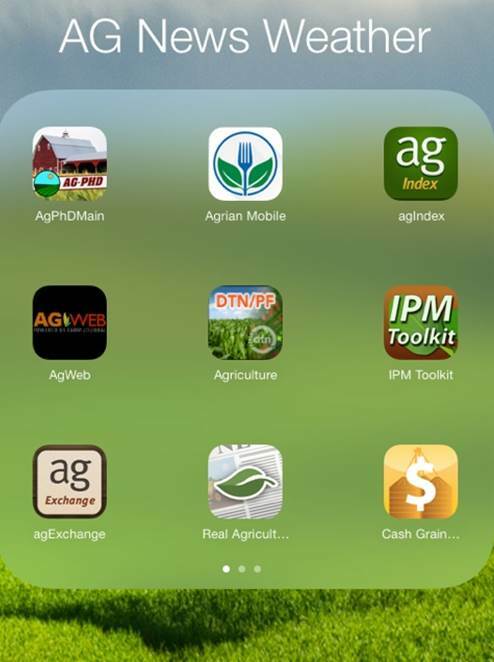 An additional nice scouting tool is South Dakota States NPIPM (North Plains IPM) app. This app provides not only a pest id tool with morphological drop down, I will discuss this in the ID Tools cat, but also management recommendation for the identified insect. The majority of the apps in this category are “Pay to Play”, which makes since as they deal with data management and storage. Many would also fit the Scouting/Mapping category. As I do not pay for many apps I do not have experience with any of these. However this is the category that I would recommend any group to look at as they should be the all-inclusive app. 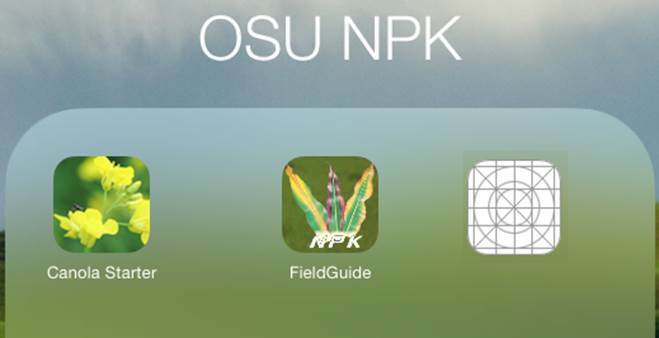 However, PeRK by the University of Nebraska is a free app designed for field records of pesticide applicators. I have added a few apps to this category but my favorites have not changed. I regularly use Plant Images, ID Weeds, and the Pestbook as references. I will add more discuss to app ID tools. The importance of being able to ID weeds and Pest via morphological drop down menus (ID Weeds and NPIPM) is extremely important. Many of the ID tools just have pictures and names. Well is I am using an ID Tool I likely do not know what I am looking at or what it is called. 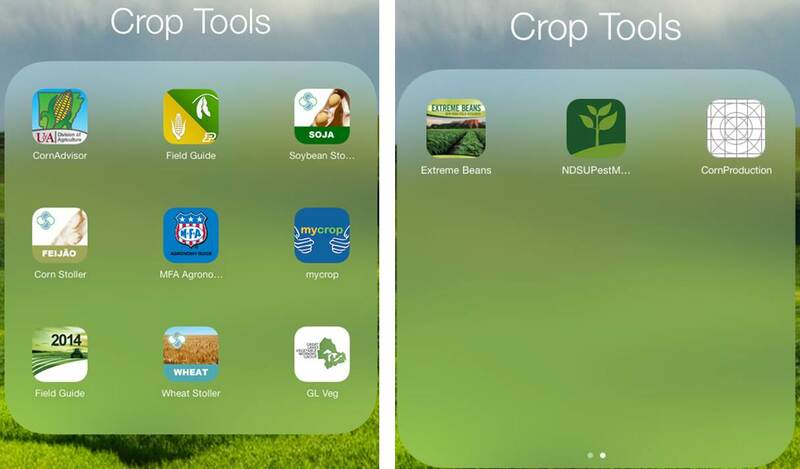 Crop Tools includes my second “Paid in Full” app. And this one hurt a bit more. Not because it cost money but because I have multiple versions of the hard copy. However Field Guide by Purdue is one of my most recommended apps. Field Guide is the electronic version of the Purdue Corn and Soybean Field Guide, which the majority of consultants in the Corn Belt likely have this sitting in their truck. 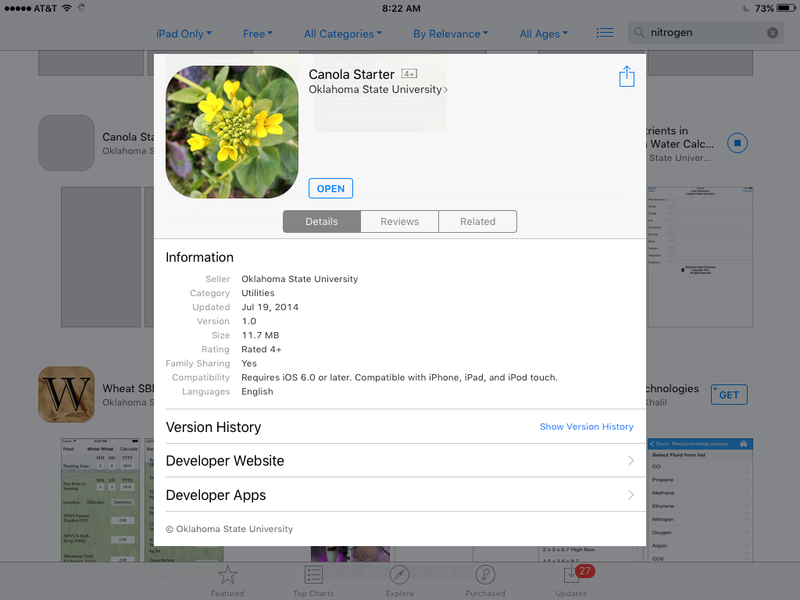 The Stoller apps also have nice very nice image bank of plant developmental phases. 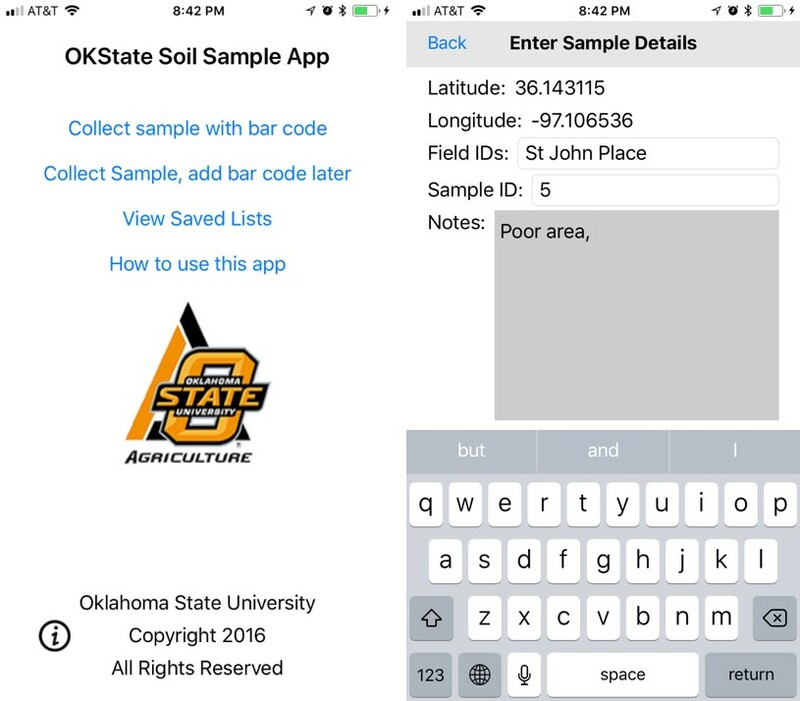 FieldGuide and CornAdvisor, another good app, are great examples of what I expect to be coming out of the majority of the Land Grant Universities very soon. Cooperative Extension has hundreds if not thousands of quality hard copy publications just waiting to be turned in to handy dandy apps. 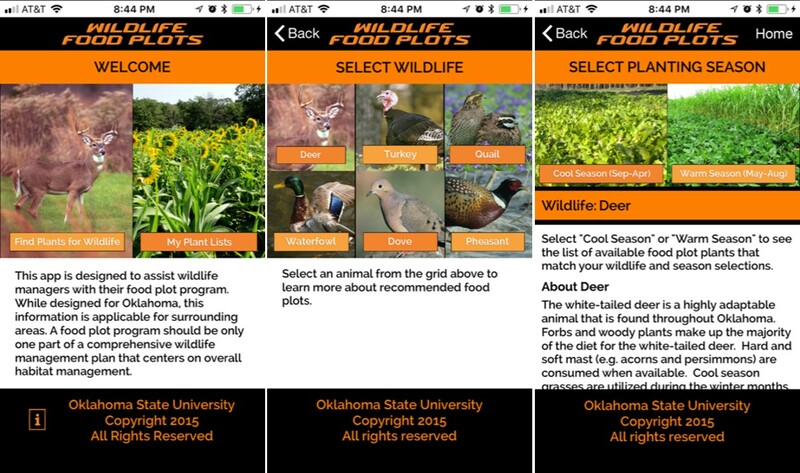 To be honest I am working on turning my Nutrient Management Field Guide into an app right now. Only two apps has been added to this category. I am still using Fert.Removal, HarvestLoss and Growing Degrees on a regular basis. 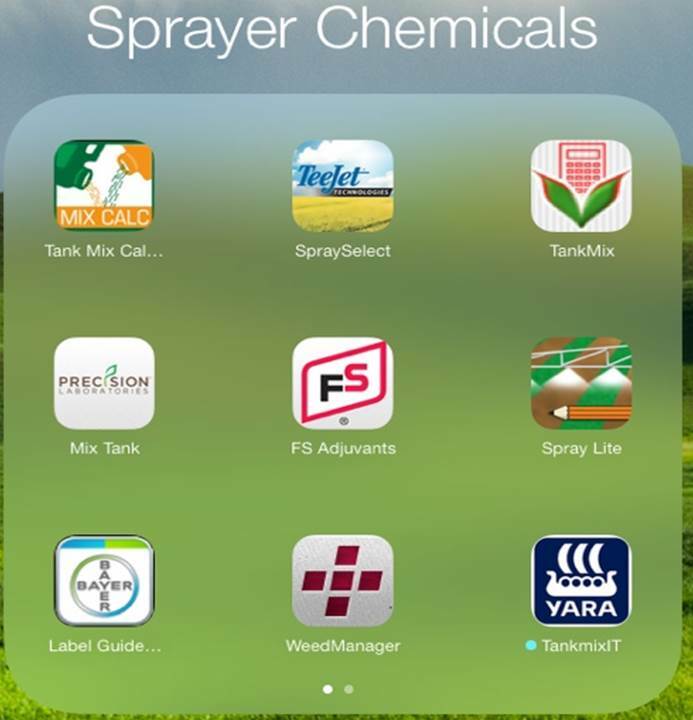 Many apps have been added to this group but none of them have been good enough to kick TankMixCalc and SpraySelect of my favorites list. 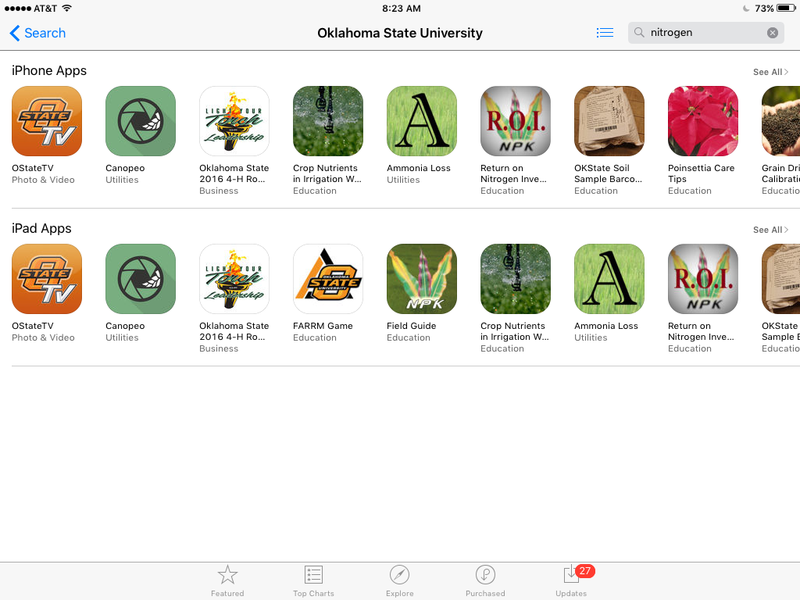 Similar to the Sprayer/Chemicals category several apps have been added to this group, including several from Ok State. 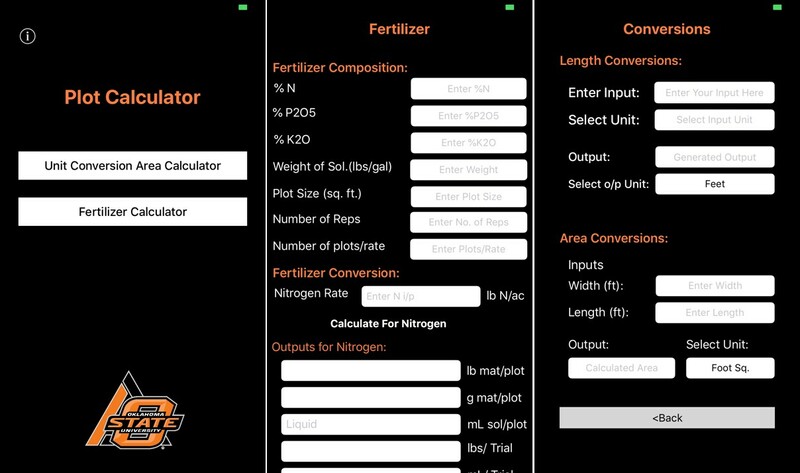 For me the Fert Cost Calc is still very useful. 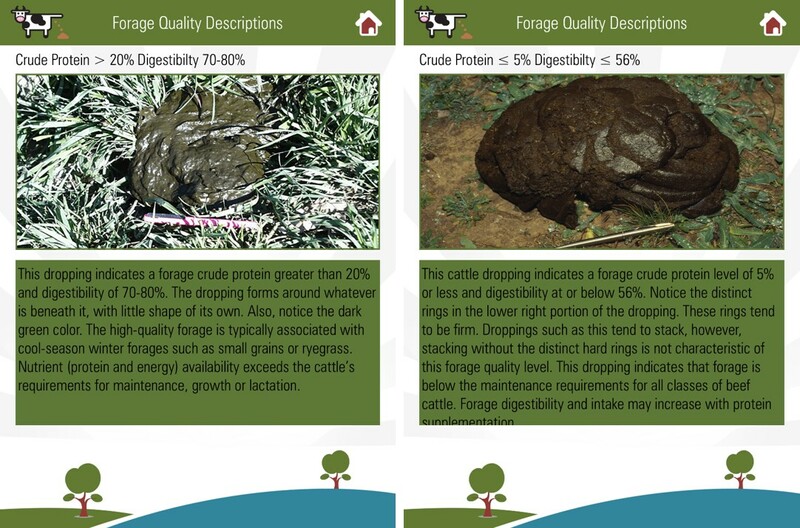 I do not get to use the Manure Calc I am very impressed by its layout and user friendliness. 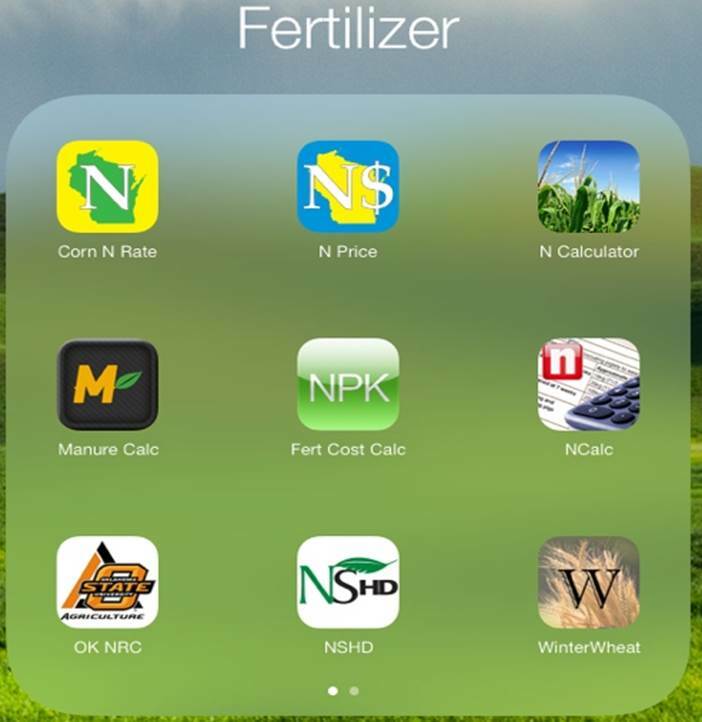 This app allows for applicator calibration, nutrient recs and manure value estimator. It is no surprise the apps in this category are company created. 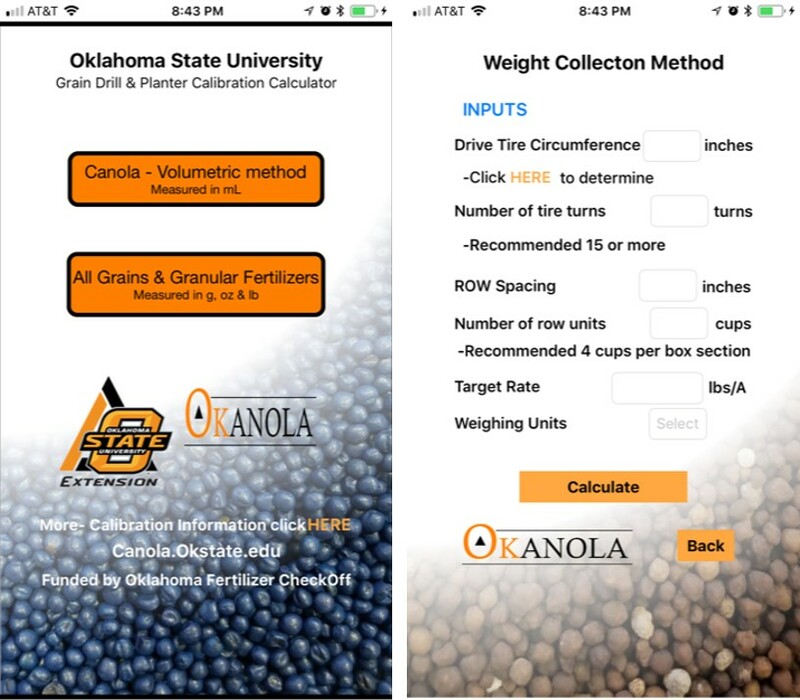 I will say for the central Great Plains Pioneer’s Canola Calc is very useful tool for selecting canola planting rate providing input for row spacing live plants, seed weight, Germ percent, and survival percent. 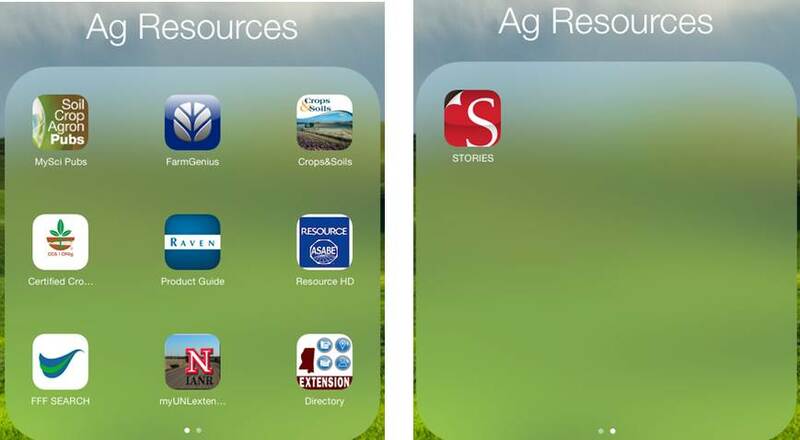 To wrap up this blog I want to share with you may new Favorite none ag app. Bump is a huge time saver for anyone who takes pics with your iPhone or iPad. Bump allows easy transfer between mobile devices but more importantly between your mobile device and desktop by a simple tap of the space bar. This file share will go both directions. This means no more emailing pictures from your phone so that you can have them on your desktop. Bump is a iPhone app that can work on the iPad. When searching with an IPad, remember to switch the search to include IPhone apps, there are some good ones out there that are IPhone only. Check out www.npk.osktate.edu/presentations to see screen shots from many of my favorite apps. So I am going to approach a subject in this blog that is Not in my wheelhouse. At the first of the year I was asked by a friend to speak on Ag Apps at the 2013 InfoAg meetings. 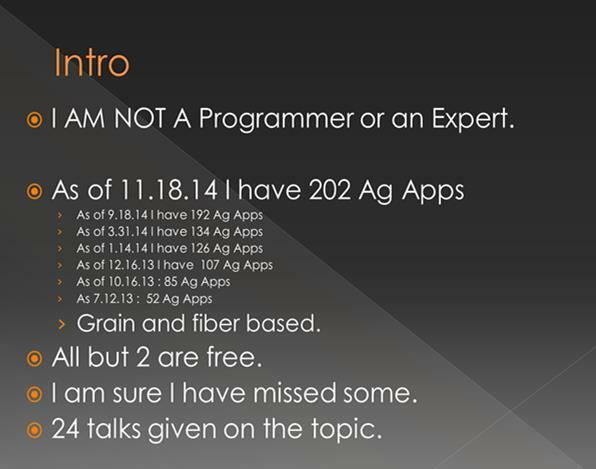 His thought was, hey this guy teaches Precision Ag and uses a IPad, he must know apps. Well, not so much. From January to the day before the talk in July I spent a great deal of time scouring the App store and working, my wife described it as playing, on my IPad. At info Ag I gave two talks, at the time of first talk on Tuesday I had 53 Free apps (1 paid), by the next morning and my second talk I had 60. Since the meeting I have had numerous request for the slides and etc, so I thought this would be a good opportunity for a blog. Since InfoAg (7.17.2013) I have picked up even more apps, the total is now 76. However many of the new apps require registration. ID Tools, Calculators, Seed, Sprayer/Chemical, Fertilizer, New/Weather/Markets, Scouting, Ag Apps (apps I don’t know what to do with). While I have 76 Apps I of course don’t use them all. What follows is basically my Editors Choice from each group. Please note I have not had the time to work with all 76 Apps. And I am by no means an expert in Apps or the use of them. I do have a basic require of any App I use. If I can not figure it out in 2 minutes its GONE. An app should be intuitive, easy to use and have a purpose. They only exception to the 2 minute rule is the Scouting Apps. Because of their complexity I allow them 5 minutes, then I am done. 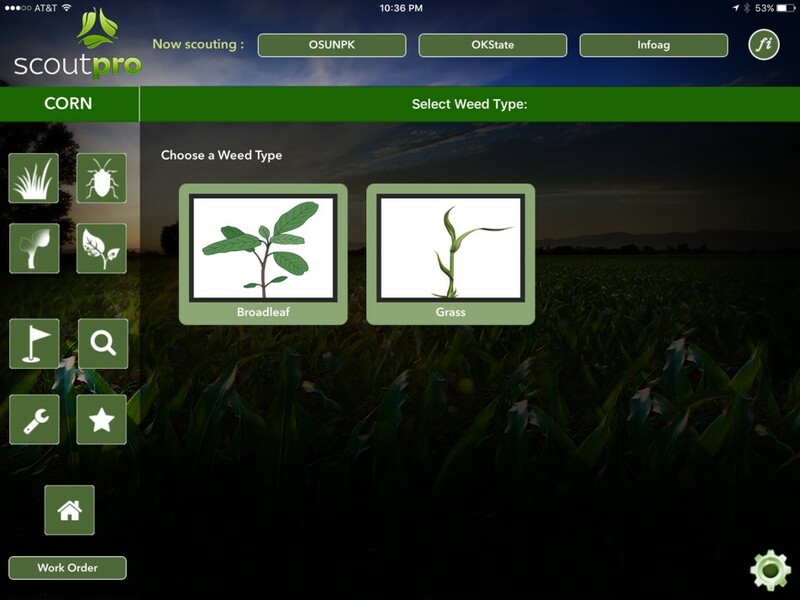 This Category holds the One and Only App I paid for, Plant Images, a library of Nutrient Deficiency photos. I mean I am a Soil Fertility guy. I regularly use Plant Images, ID Weeds, and the Pestbook as references. 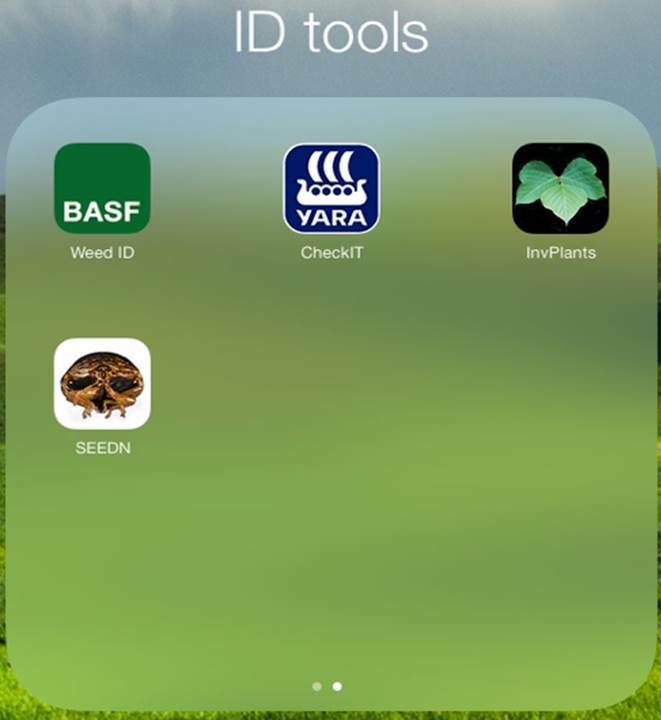 ID weeds is a true ID tool as you can use attributes to ID your weed, while the other two are visual reference tools. 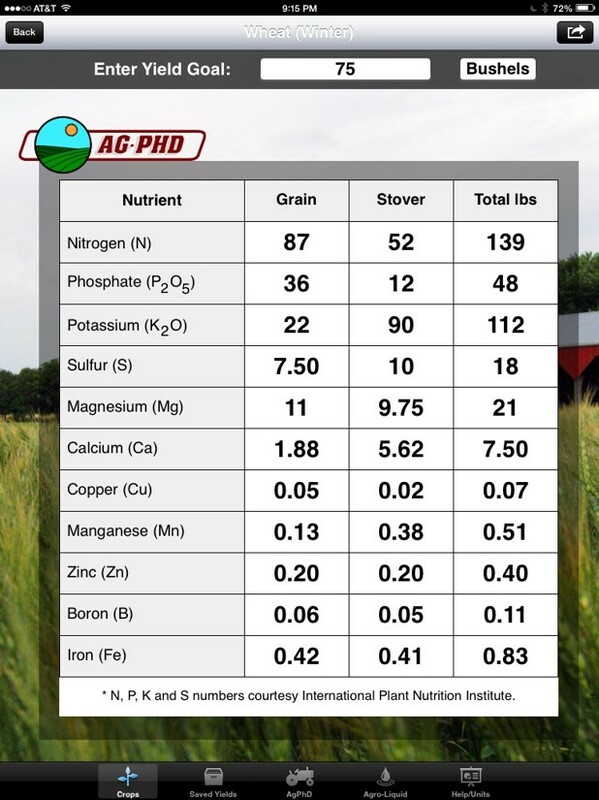 I personally use the two Nutrient Removal Apps the most, but after the latest update AG-PhDs Fert. Removal has become my favorite as it allows you to entire any yield level. 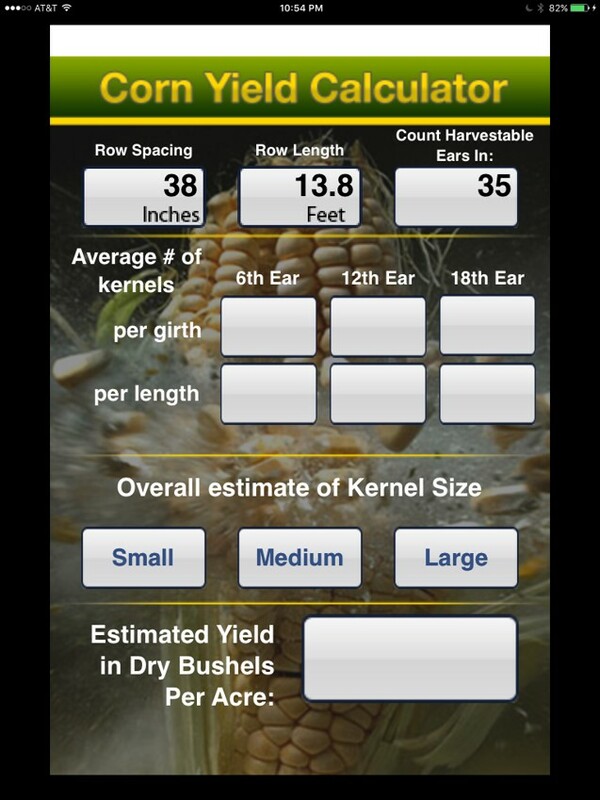 Harvest loss is also a handy App that lets you put $ to combine inefficiencies. I do not use these often as I only do plot work, but I can see there usefulness in a operation. This group contains two of my first Ag Apps and most frequently used. Being a fertilizer guy herbicides are not my forte however I use the often. TankMixCalc and SpraySelect has been in my App arsenal from the beginning. 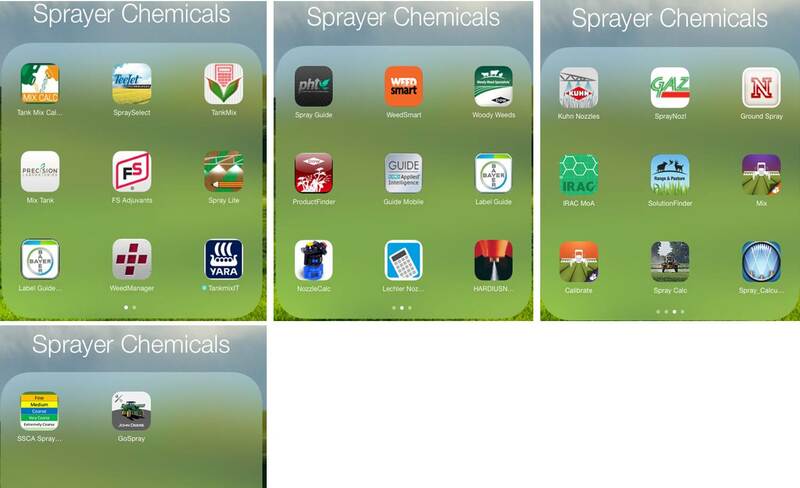 The nice item about many of the Sprayer Apps is the ability to save/store mixes or provide record keeping. 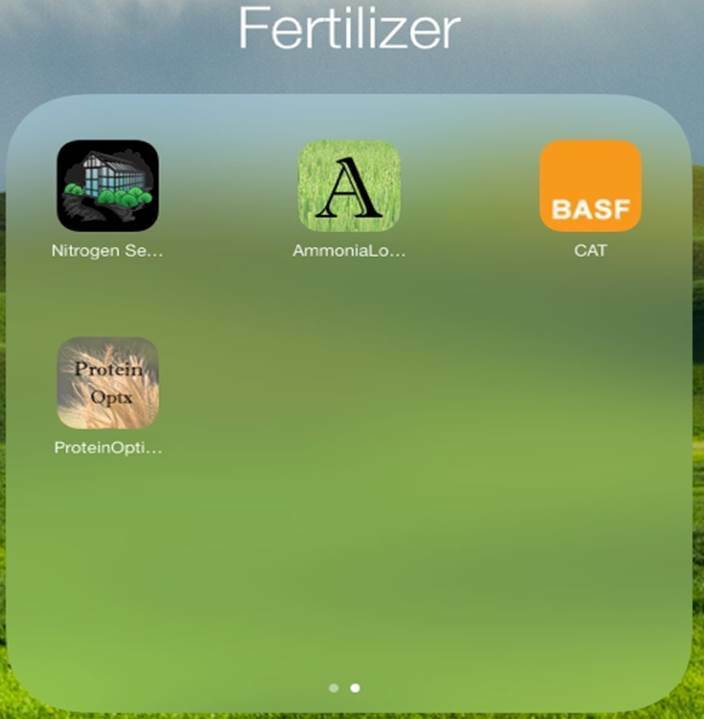 Now the Fertilizer Apps are right up my alley. But the only ones I use are the Cost Calcs. As far as fertilizer recommendations go you must remember they are quite regionally specific so the Wisconsin Corn N rate Calculator does me little to no good. This is the category that I have the most apps. My first was Agriculture (DTN/PF), so I fall back to it often but I also like AgIndex and AgWeb. With the news/marketing ext apps the biggest key is find one that a) reports on topics of interest to you, they do differ and b) has a layout and design that is easy to use and enjoy. The Scouting tools are a bit different, most but not all require registration of some kind. I like most that I have tried but each has their own high and low points. The use of a scouting tool will be highly dependent upon uses, goals, and what companies you currently work with. 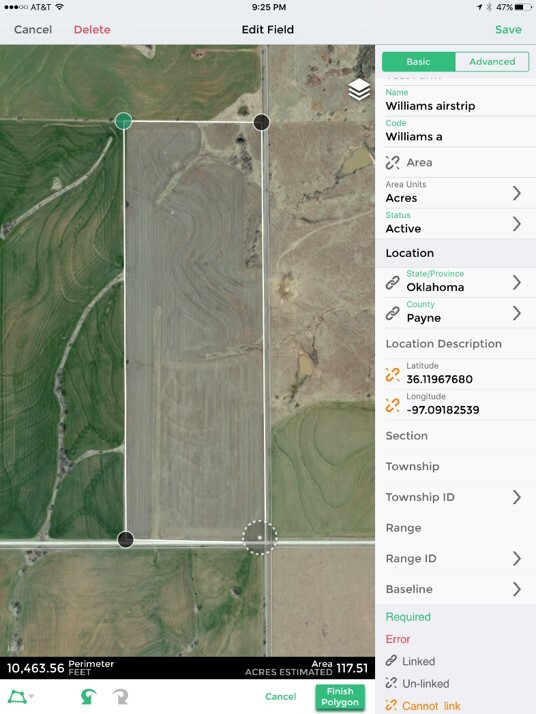 For example Field Notes 360 has some nice points, you can make notes on photos, but you have to be a Pioneer employee or customer to get full use, I like Scout (Connected Farm) note taking capability and the fact you can input GreenSeeker NDVI values. I have the beta version of Sirrus but I can all ready tell you it is shaking out to be my favorite. Two wins for Sirrus, its method of creating and editing boundaries is top notch but what I like the most is its ability to set up a direct grid sampling. 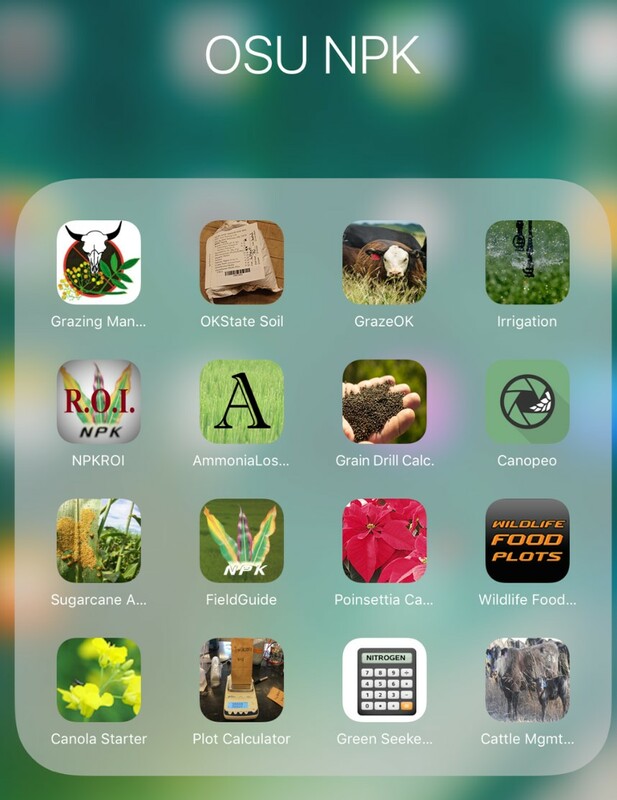 This folder holds my Scientific Pub app the Web Soil Survey app, ArcGis app and the loan Ag game that snuck its way in with a official sounding name FarmGenius. I don’t expect any app to change my life or yours, but it may make it easier. 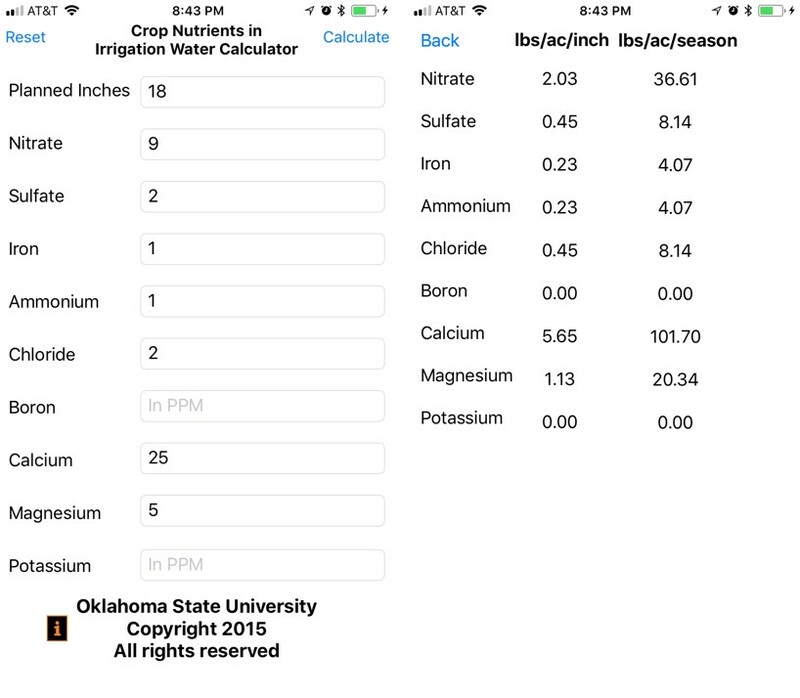 The ID Tools, Calculators, Sprayer/Chem and Fertilizer apps are nice when I am in the field with a producer and just break out the IPad for easy demo/explanation. There is a multitude of apps available and more being produced every day. Just as everything else find what suites you regardless of others opinions. When searching with an IPad remember to switch the search to include IPhone apps, there are some good ones out there that are IPhone only. If you want to see my presentation from InfoAg, checkout their website www.infoag.org/program3 or go to the http://www.NPK.osktate.edu website and download the PDF of the slides under the Presentation tab.